Schnittke's German family roots were to be unearthed by world events. After some years in Vienna under Russian rule he moved to Moscow in 1948. He studied at the city's Conservatory and became acquainted with the music of the Second Viennese School. In 1962 he began working on film scores (vol. 1 vol. 2), an industry from which he sustained a living. His concert music was for many years not welcomed by the Soviet artistic world. From the 1970s he was hit by a series of strokes that eventually brought about almost complete paralysis. He died at the age of 63 in Hamburg where he had moved in 1990. The first two of these figure in sessions from the 1980s on this far from anodyne bargain price disc. The first Concerto Grosso is heard in a live performance in Leningrad - there's a cough in the penultimate Rondo and applause after the final Postlude. The music seethes with vitriol and disquiet. Edginess and abrasion arch over the whole score - for example in the steely buzzing of the Toccata (II) and elsewhere when baroque manners meet sour twentieth century disillusion. Vivaldi is the embarkation point for the Rondo. This is a virtuoso performance as may be expected from Grindenko, Kremer and Bashmet - the latter surrendering his viola in favour of the baton. Understandably the music is met with applause which shows that old resistances have fallen away - at least in enlightened Leningrad. The six minute longer Concerto Grosso No. 2 is in four movements rather than the six of the First Concerto. The conductor is Gennady Rozhdestvensky who recorded the first four symphonies for Melodiya. The confident performance is alert. It brings out the lightness, carillon and almost Caribbean rumba qualities of the opening Andantino. The concentrated self-contained melancholic calm of the Pesante second movement is lovingly communicated. The Allegro (III) delights, with its airy flutes, but its mood changes so that by the close a raucous catastrophe has taken over. The long finale finds pensive quietude and there is much grateful introspective writing for the two distinguished soloists. The work's earlier pages include Schnittke's trademark scarifying dissonance but in this last movement he finds healing plains and delectable mountains. Both performances are appealingly intense. The recording quality and the soloistic writing - which extends beyond the named solo instruments - does nothing to undermine this. Peter Avis squeezes plenty of solid factual information into the three-fold insert. Artist profiles are also provided. 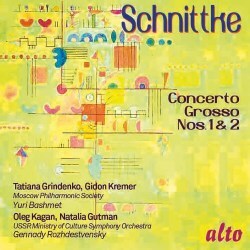 Schnittke here delivers rough trade and sophistication. Healing beatitudes meet enigmatic excoriation. Fascinating music, tangy performances and immediacy of sound. A risk-free way in to Schnittke's uneasy and provocative art.